With both quick hitch brackets and fork channel guides, our man riding safety cage can be mounted to your telehandler of choice in a variety of ways. With 1400mm wide and 2440mm wide sizes to choose from, this telehandler range of safety cages also comes in either a painted or galvanised finish. Strong and robust, the design characteristics of our telehandler platforms are suitable to cope with the rigors of markets such as construction, plant hire, agricultural or industrial. If you need to carry out working at height tasks safely, then our range of telehandler platforms offers a safe, stable and protected deck from which to do so. 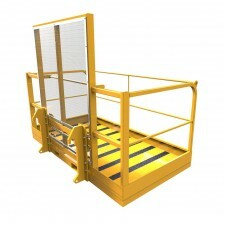 Why not investigate further the range below and discover how our telehandler cages can benefit you?